Sparty rules over East Lansing and the Spartans plan to Rule the Big Ten again this year. It is a time for excitement all around the country. Time-honored traditions, cherished camaraderie and the exhilaration of sport. It&apos;s the return of college football and around here, it means a brand new season for the Michigan State Spartans. It&apos;s no secret last year was one for the ages. What were the highlights? Um, well...how about putting a whooping on Michigan, winning the Big Ten Championship in Indy and then capping it with a come from behind victory in the 100th Annual Rose Bowl Game. While a season like that is hard to top, I know Coach Dantonio and this year&apos;s gridiron warriors will be out there doing their best and playing with pride. The exciting 2014 season kicks off this Friday with a game in beloved (and recently renovated) Spartan Stadium at 7:30 p.m. Now whether you go to this 1st game or another one this season there are some things you should know. Let&apos;s call it Spartan Game and East Lansing Tailgating 101. Lots open at 7 a.m. for a 1 p.m. game so get there at least 4 hours early to set up, eat, clean up and then get fired up to be in your seat for kickoff. Munn Field is an alcohol-free parking area close to the stadium that is ideal for family tailgating. 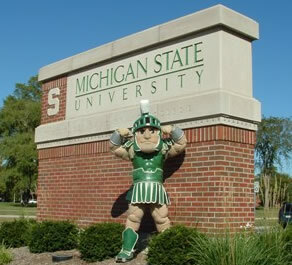 This is not the day to wear your blue flannel shirt Show off some Spartan gear! Get some cool stuff at the Student Book Store, Underground Printing or at the Sideline Shop inside Spartan Stadium. If you can get a tailgating spot near the Sparty Statue you can see the team and the MSU band do the traditional walk from the Kellogg Hotel and Conference Center to Spartan Stadium. While your cell phone, a blanket and a seat cushion with no back are okay, leave your purse, umbrella and beverage at your tailgate spot. If you hear someone shout GO GREEN, the response (of course) is GO WHITE! These key bits of info will help you out but visit the MSU website all about tailgating rules for the full list of do&apos;s and don&apos;ts. Like I always say, you don&apos;t have to have tickets for the game to be a loyal Spartan follower. Grab a seat at a local pub or sports bar and cheer the Spartans on as you watch the action on numerous Big Screen TV&apos;s and over hot wings, fries and a couple beers. Let&apos;s get fired up people! It&apos;s the return of Spartan Football - let&apos;s protect that Big Ten and Rose Bowl trophy and have another year of pure Spartan excellence!